1. GOP Take "Betraying Thier Oath To the Constitution" To A Whole New Level! GOP have now established a verifiable tradition of defying the Constitution and lying with intent to obstruct justice or deceive the people. 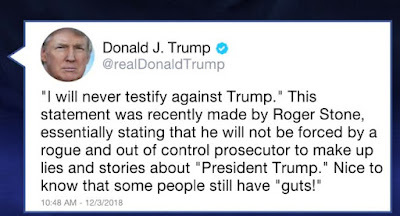 The latest post just adds to the growing evidence that the GOP are not following BASIC precedent concerning Obstruction of Justice established from the Nixon impeachment by the Congress of that era. In other words, they are in clear violation of their oaths of office by not impeaching Trump for obstruction of justice AND the emoluments clause. The Russia collusion thing is a separate issue altogether. GOP are traitors and they prove it everyday (more links to proof below). Trump is clearly trying to influence and silence witnesses!